I’ve been keeping myself busy with too many things to count (all but cleaning, that is), but I keep making time for knitting. I’ll admit it’s slowed down since the thermostat has been reading over 90°, but there are still projects in the works. And of course, knitting “class” every week. All this talk of football has me looking forward to hours of being posted on the couch with a skein of yarn in my lap. But the rotten thing about all my working projects is that they’re all gifts. Gifts = Secrets. I don’t know why I torture myself with keeping things on the down low but I do. It’s all hush over here. But I’m very excited about my latest project. It’s coming together quite brilliantly, the colors are perfect, the comfy worsted yarn is very comfy (thus the name) and it’s pretty darn adorable. It’s purple. Actually, all of my current projects are purple. I may have to throw in another small one just to mix up the color palette I’m working with. As reluctant as I was to start knitting [because in my mind it’s what old ladies did], I’m happy that started clicking my needles. If my Mom hadn’t joined in her knitting circle, I would have never even tried. But I love it. I love to be able to create something with string and sticks. I love that two stitches can make so many different patterns. I love seeing how creative and intricate others can be with the same materials. And I love sharing what I make. Thus all the secret knitting. It’s a viscious cycle. But I think it’s worth it. 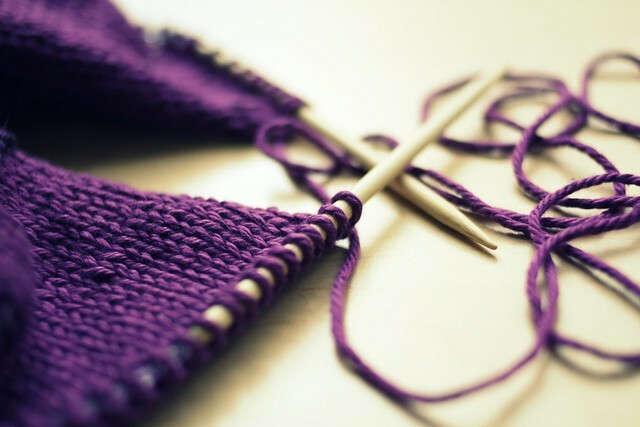 Kelly - I’ve never knitted – have rocked a mean cross-stitch and potholder loop in my day – but your post makes me want to start! Brooke - The ladies I meet with are hoot. I’m the youngest but I finally roped Susan (the gal formerly known as PodMate) into going with me. But I bet the ladies at the library also know how to crochet. If you want to crochet in our group, you’re on your own! Stacy - Knitting can be quite rewarding, can’t it? I just need to remind myself “small projects.” Because I burn out half way through bigger ones…. Heather @ Get Healthy with Heather - I go through phases with knitting but so wish I stuck with it! You can end up with some amazing pieces.